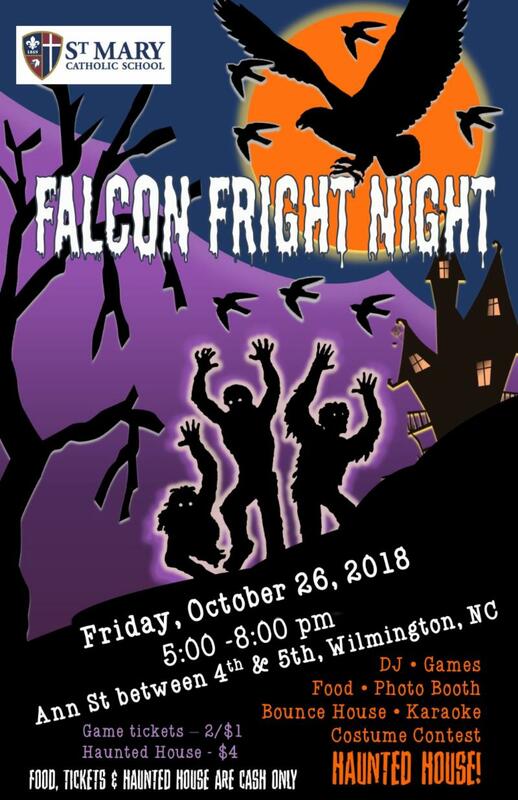 Falcon Fright Night! Next Week! Buddy classes are the best! St. Mary 5th & 1st Grade buddies got together today for a "pumpkin lab" and addition dice game. Hoops Season is Here! St Mary Boys’ Varsity Basketball team, under the direction of new coaches Brad Walker and Andy Goodman, will be starting practice for boys in grades 6-8 on Tuesday, October 23, 2018, from 3:15-5:15 in the Tileston Gym. Mr. Viollis distributed the 3 required form needed to participate. Please make sure you have your paperwork submitted or bring it with you on that day. If you do not have the forms, get in touch with Mr. Viollis at viollisa@thestmaryparish.org . We are looking forward to an exciting new season and direction. Come out and be a part of the team that will make a difference. 3 V 3 Basketball Tournament: On Sunday, October 21 (that’s this Sunday! ), we will be holding, for the first time, a 3 V 3 tournament for our 4 th - 8 th grade students from 2-5 pm in our Tileston gym! There is no cost. We are trying to bring back our basketball program and get our students off the couch and onto the hardwood. The flyers with all of the information have gone out! If you would like to come and watch or participate, please fill out the flyer you received and bring it with you Sunday. Volunteers are always welcome. I hope to see many of you there. Athletic Boosters: I am still running a campaign for parents to be a part of our big team, our Athletic Boosters. We will work together and see what we can do as a team to help all our young athletes of St. Mary. Just fill out the form and you will receive an optional Booster t-shirt and free admission to all our home basketball games. We have done so much in the past, let’s see what we can do for the children now and in the future. 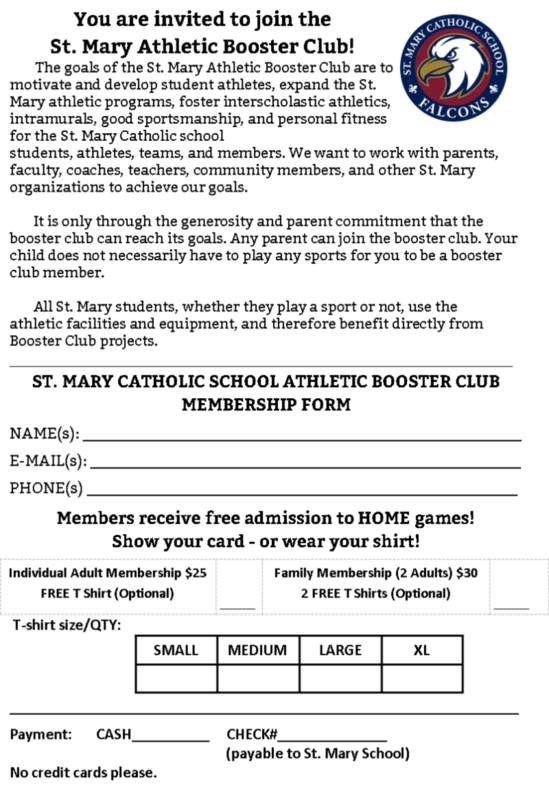 Athletic Score Board: We need parents (2) who will help out during home basketball games and run our new score board. We can set up a time and you can meet me in the gym for a demonstration. If you would like to help, please be in touch with Mr. Viollis. Spirit Wear: We just had our first of many Spirit Wear Days. If you would like to purchase something for yourself or your children, please download a form and put your winter order in now for next month. Let’s show everyone that St. Mary is a tight family and unified in everything we do! Fencing Program: We are working to form a St. Mary Fencing Team. We need a minimum of 3 fencers to make a team. This is an exciting, fast-moving sport where you can show your individual talent. If you are interested see Mr Viollis or Greg Spahr in the basement of the gym. Cheer Leading Team: If your daughter has the spirit and would like to share that spirit and cheer with our school cheer leading team, please contact Marcia Frelke, our team coach. She is preparing to order uniforms, so hurry and be a part of the most spirited group at St. Mary. Go Falcons! Lively is Back! Who would like to be our Falcon Mascot, Lively? Lively is looking for someone to fly him or her around the gym during home games. You can get our fans into the game by leading them in cheers. Get the spirit flying! Are you lively enough to be Lively? See Mr. Viollis. 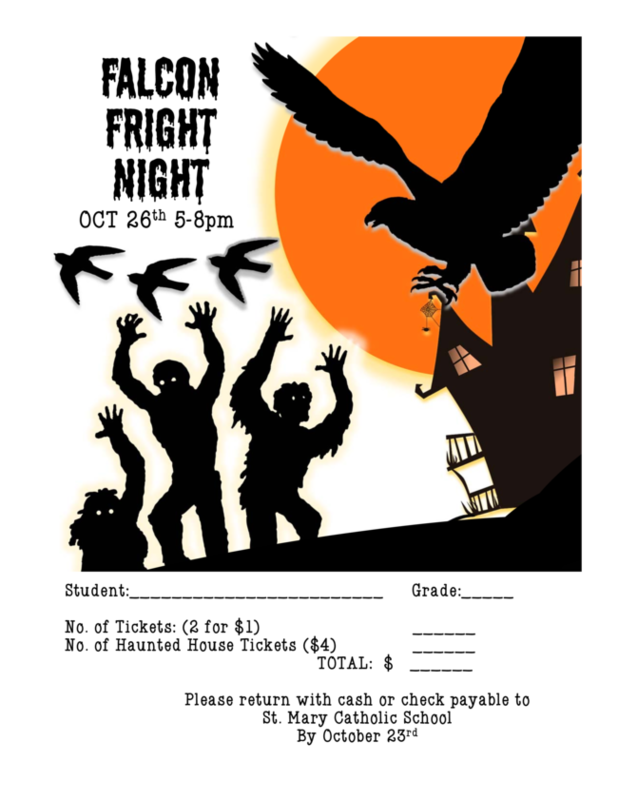 Falcon Fright Night! Friday, October 26th! As we mentioned previously, the HSA will be providing students with bracelets next week that will entitle students to play all games for free, including the inflatables and photo booth. This does not include the Haunted House or Food. Tickets to the Haunted House and food will be cash only that evening. In the event you have others attending who are not students, please see attached pre-sale form. You can also use this form to buy your Haunted House tickets in advance. While this is not necessary, it would greatly help to reduce lines and will help the 8 th grade get a sense of the number of visitors to expect. You can turn in your form and cash/check by Tuesday to your student’s teacher. Tickets will be returned to you via student folder by Thursday. If you have not already done so, please sign up for a slot to volunteer. There are a lot of spots that are still open. Your participation is critical to making this event a fun evening for all to enjoy. All slots for a game have to be filled. Also, to clarify some confusion over the soda pop toss, we will have the game, but soda will not be the prize this year. We will not have the cake walk, however. I know that this is disappointing to some, but we wanted to focus on parents volunteering their time in lieu of cake and soda donations this year (and there is limited space in the school to store soda and baked goods). We will be available to teach people about each game before the event. The volunteers before you will be responsible for telling you the rules of the game so don’t let your unfamiliarity with a game prevent you from signing up. They are all very simple. Lastly, if there are any alumni who would be willing to run a game, their help would be greatly welcomed. It is a great way to get volunteer hours! We are looking forward to a fun evening! Download presale form below and return wth cash or check payable to St. Mary Catholic School by October 23!